You’re planning a party. Magic Peter has specialised in making children’s parties stress-free, unforgettable fun for more than thirty years. He performs magic shows and party entertainment for children and family audiences at birthday parties, Easter, Halloween and Christmas parties, weddings, christenings and other family occasions, as well as at school celebrations and corporate events. He performs in pubs and hotels, village and community halls, schools, offices and private homes, on village greens and school playing fields. He’s even performed on a moving double-decker bus chartered for a company celebration. Whatever your celebration, whatever the venue, Magic Peter has a children’s entertainment package for you. 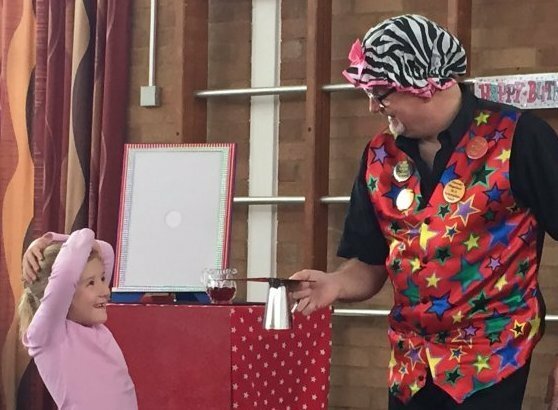 Talk to Magic Peter if you’re organising a kids party or family event in the Abingdon, Didcot, Wantage or Wallingford area, or further afield in Witney, Oxford or Newbury – even Banbury or Bicester, Swindon or Reading.